“Dreams are trash”, said the Hemulen. “How does one know?” I objected. 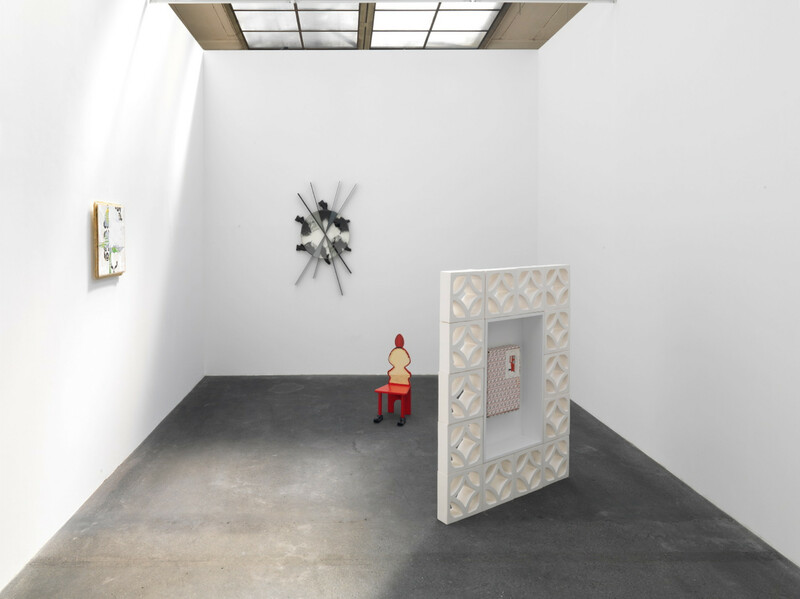 KÖNIG GALERIE is pleased to announce its second solo exhibition of LA based artist Lisa Lapinski. For this exhibition Lapinski will present a new, diverse body of interrelated sculptures and wallpaper works. What does a trademark smell like? 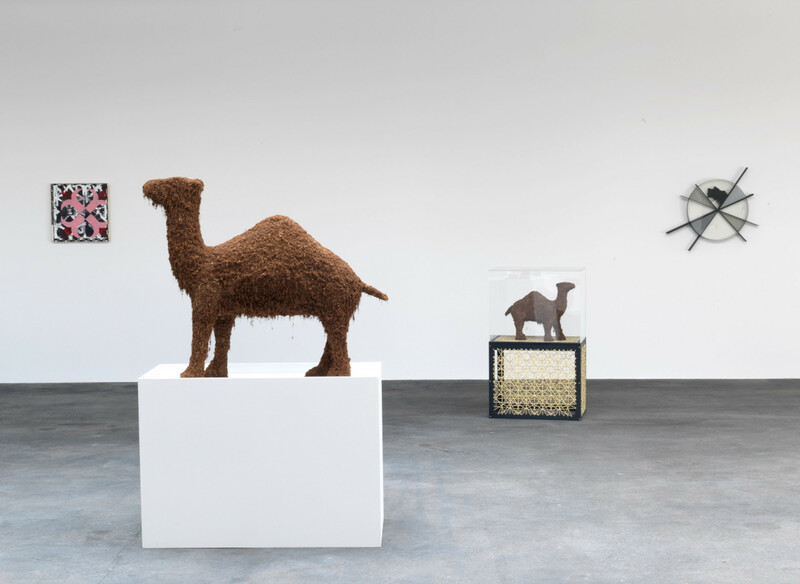 The prominent feature of Lapinski’s exhibition is a group of camel sculptures made of tobacco fixed to taxidermy forms. 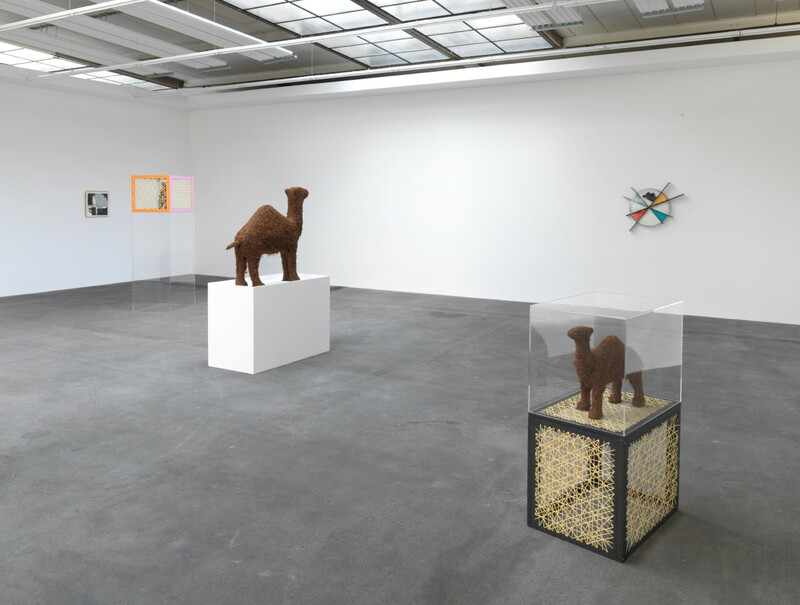 The sculptures have a seductively tactile surface and a strong aromatic presence, an earthy, nostalgic, and slightly noxious fragrance that fills the gallery. The largest camel, measuring 100 cm high, presents a striking dark silhouette when seen from a distance, which belies the roiling texture of the tobacco “hide” when examined up close. 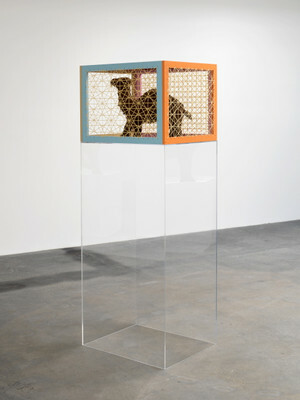 In contrast, several miniature camels rest inside caned boxes, the exterior patterns creating a protective, or ensnaring, screen from the viewer. The caning is handcrafted, but the seemingly machinic patterns take on an almost science fiction quality. Based on the familiar and ubiquitous logo for Camel cigarettes, the figures are reminiscent of the classic image of the dromedary in profile on the package, a strangely banal yet exotic animal of no natural habitat. 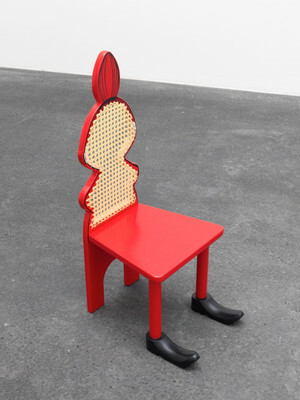 The use of iconic or omnipresent images is a common theme for Lapinski. 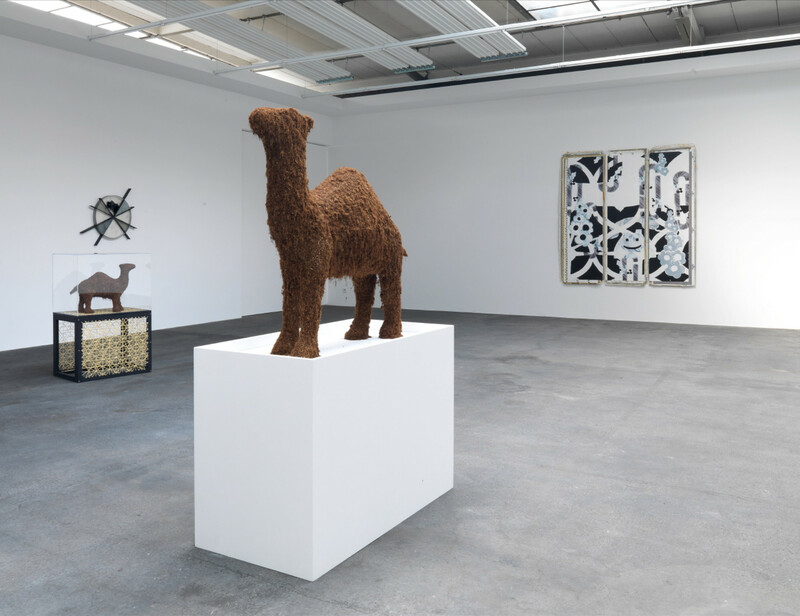 The artist has said “I watch for things which are so general or obvious that they don´t give you any information", and conversely, "…I also deal in things which are very specific to the point of idiosyncrasy.” Like much of Lapinksi's work these new sculptures fall into both categories. 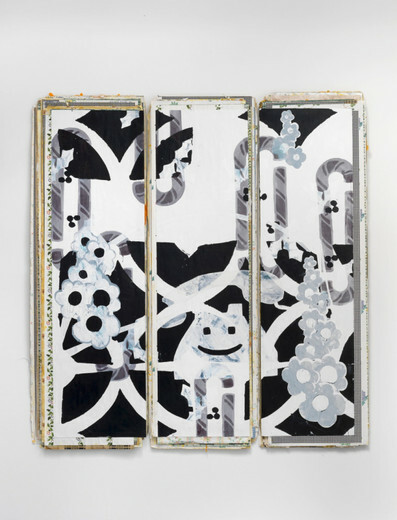 In an ongoing series of wallpaper pieces, Lapinski stacks and pastes together numerous sheets of wallpaper that fuse into densely layered panels that form unique supports for mixed media paintings. The panels are solid and heavy, but with fragile edges where the various mismatched papers are loosely stacked. The edges reveal glimpses of the various generic, yet clashing, prints and patterns of remaindered papers. 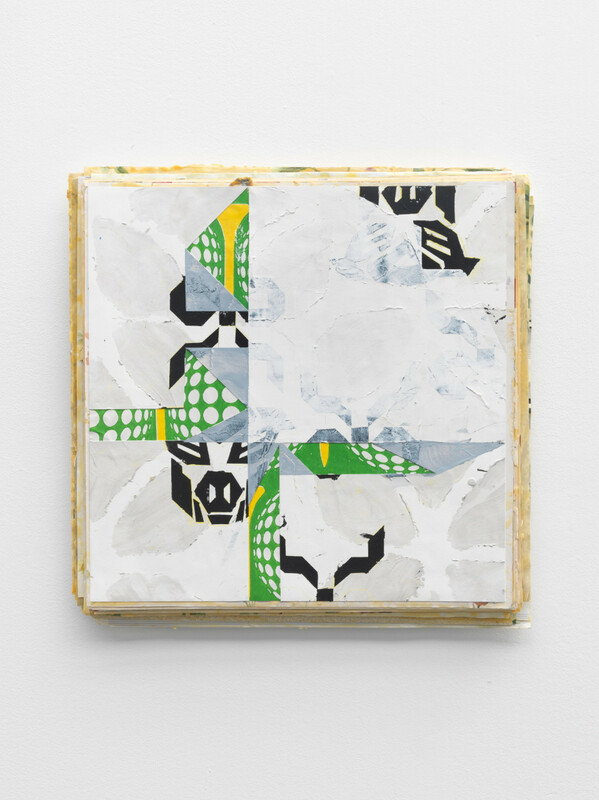 The paintings, based on a shifting cast of borrowed patterns, logos, and geometric forms (quilts, Transformers, a Christmas candy cane box) sit in conversation with the hardened scraps of wallpaper on which they are mounted. Lapinski’s Disk sculptures appear to be a cross between a scientific diagram and a shoe display at a trade convention. Also part of an ongoing series, the large circular disks hang on the wall or lay on the floor. 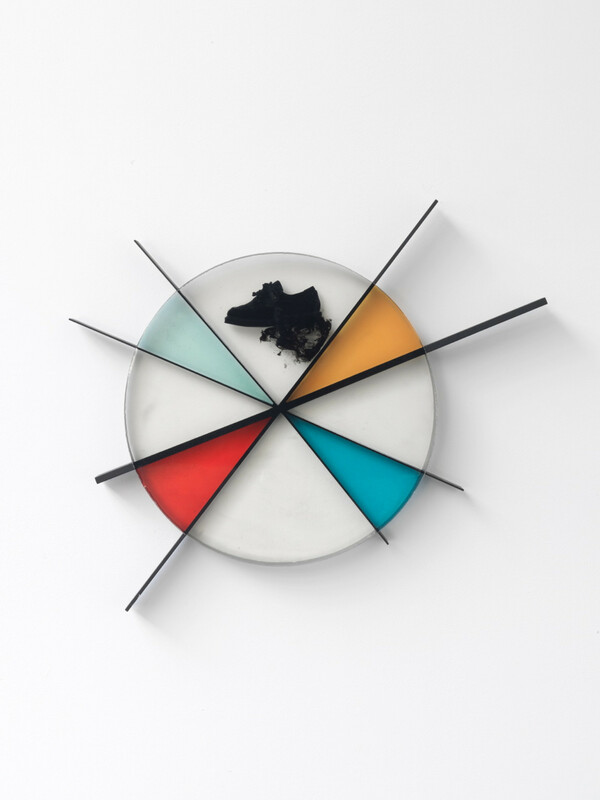 Made of epoxy and bisected with steel rods, they resemble pie charts with clearly defined slices of varying size and color. A black oxford shoe is imbedded in the epoxy of each disk, as if either totally enveloped by or violently forcing its way into the structure. Suggestive of an accident, like a pedestrian stepping into wet cement, the lost shoes seem oddly at home in the slick epoxy. For Lapinski, the Disks are spiritual offspring of El Lissitzky’s famous Fur Trade Exhibition pavilion of 1930, in which the sliced-up objects on offer are both glamorized and destroyed at the same time. There are two final sculptural works in the exhibition. For Moomin Chair Room 2, Lapinski has taken a mass-produced children’s chair and refashioned it by cutting out the cartoon face painted on its back and replacing it with a hand-caned surface exactly fitting to the hole made by the cut. 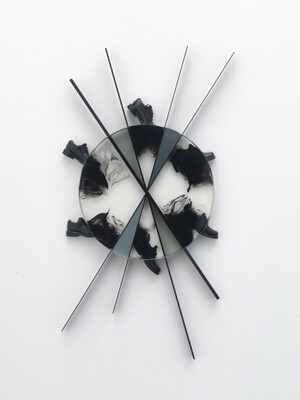 The result is a beautiful but eerily deformed object. In Mimpy Mimp #9 a slightly worn Neiman Marcus gift box is heroically but awkwardly framed by a large decorative ceramic blocks. The ceramics are elegant versions, created by the artist, of the inexpensive concrete screen blocks commonly found in Los Angeles building supply stores. The box is physically fragile yet somewhat intimidating with its very expensive logo. 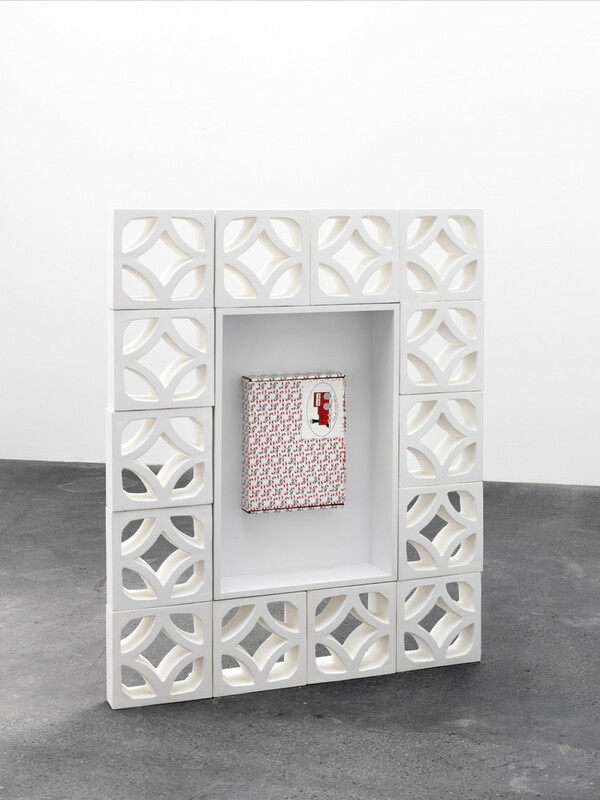 Like the family of camels and the caned face it shares the exhibition with, the candy cane box is both framed and screened, protected and threatened, by the display apparatus it is fused with. 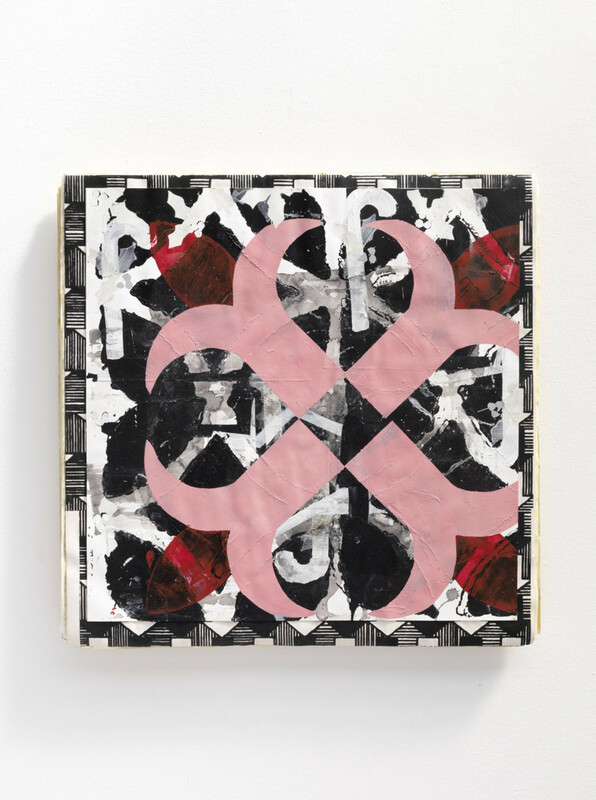 Lisa Lapinski lives and works in Los Angeles, CA. She studied at the Art Center College of Design, Pasadena, and has had solo exhibitions at the Midway Center for Contemporary Art, Minneapolis (2007), Moca, Los Angeles (2008), Richard Telles Fine Art, Los Angeles and Taka Ishii Gallery, Kyoto. 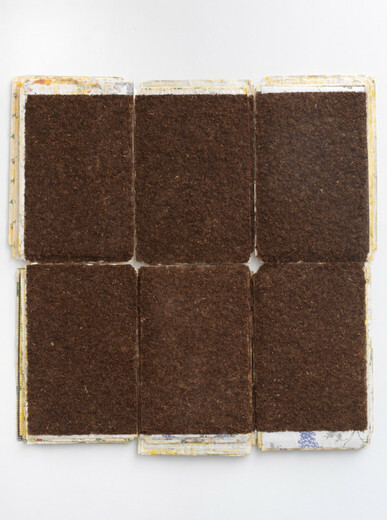 Her work has been exhibited in group exhibitions at the Hammer Museum, LA and Bundeskunsthalle, Bonn.